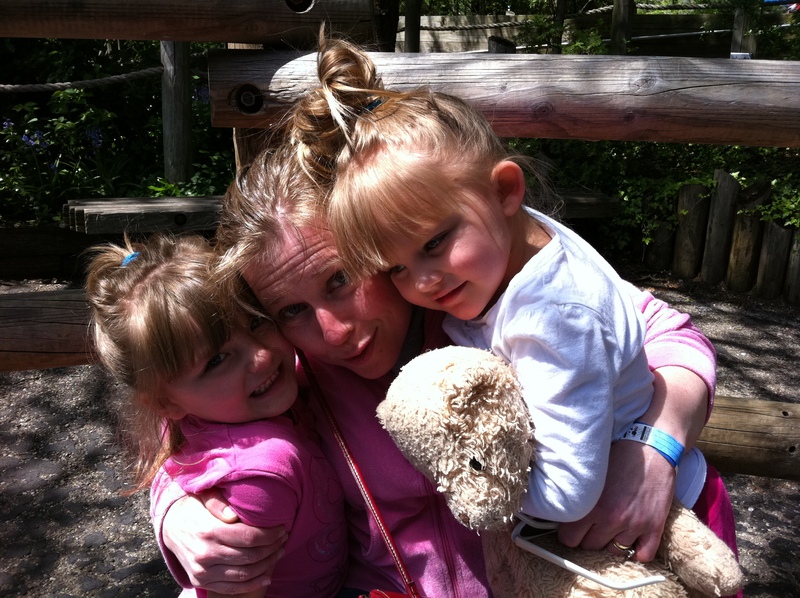 Heather visits the Cincinnati Zoo with two of her favorite little friends, Aubrey and Carly. As many of you know, November is a fun month for us. We host our annual Fall Feast, when we literally cook for days and then invite all our favorite people to gather together to share a special meal and make new memories with us. But it is also a month when we tend to reflect on and define “family,” and find new ways to celebrate the folks who have touched our hearts in so many ways. We have both been fortunate enough to have people populate our lives who truly impacted us for the better. Some of them were relatives, like my great-grandmother Catherine, who taught me the importance of loyalty whenever she had me crawl up onto her bed so she could tell me stories about Hachi and other dogs who loved and protected their masters come what may. My great-aunt Editha, whom I met later in life at my grandfather’s funeral, had a heart as big as the ocean, and taught me to bravely see the world through the eyes of an artist, to embrace the aspects of my personality that made me unique and refuse to conform to societal norms. With their unfailing love and support, these women worked their own brand of magic, teaching me life lessons I’ve never forgotten and shaping the man I eventually became. Yet blood ties aren’t the only ones that feed the vines of our lives as we continue to sprout and grow. Friends also play an equally important role in our life story, acting as mentors, guides, and companions along our journey. Edna, a matronly friend of Heather’s, was like an adoptive grandmother who taught her to believe in herself and to forge her own path. Sandra, Heather’s best friend’s mother, counted Heather as one of her daughters and always offered a listening ear. As for me, there were men like Al, a teacher and journalist, who taught me the power of the written word and infused me with the courage to use my voice to raise awareness and affect change, regardless of people’s personal opinions. We’d love to tell you about countless others, about friends who became family, who taught us important lessons with grace, laughter, love and respect, for each of them touched us in their own unique ways and truly live on within us, as parts of us. Undoubtedly, you have similar memories too. The reason we share these stories with you, though, is to help you realize that even small, altruistic acts of compassion and generosity, create a ripple effect of change. One act of kindness begets another. Some refer to this as karma, the golden rule, or even paying it forward. Regardless of what you want to call it, however, if we stop and really analyze the precious moments and people in our lives, this will likely serve as impetus to do something to improve the lives of others and the world we live in. This month is National Adoption Month, when we raise awareness about adoption and the youth in foster care. Currently, thousands of children are in the system, waiting patiently for their forever families. These kids, each beautiful in his own unique way, want desperately to belong, to have families they can trust and who love them unconditionally. Perhaps you’ve known people who have adopted, or were even adopted themselves. When my uncle John was a sheriff in California, he and his wife adopted three children, rescuing them from a nightmare situation, so I’ve witnessed firsthand what a marvelous thing adoption can be. On the flip side, however, I also understand how badly children can suffer. If you live in Cincinnati, you may have read or watched reports about children like Damarcus Jackson or Marcus Fiesel, toddlers whose lives were snuffed out by the people who should have protected them, rather than murdered them. These stories are heartbreaking and tragic, and in many ways are more horrifying than something even Stephen King would write. That’s why we want to encourage you to open your hearts and consider adopting a child into your family. For more information, including valuable resources, financial assistance, photo listings of children currently available for adoption and more, visit AdoptUSKids.org. The Dave Thomas Foundation for Adoption also offers great links, workbooks and other informative tools to help you build your family today. If you can’t adopt now, there are other ways to get involved and help at-risk children. Volunteer to tutor at your local schools, and in as little as one hour per week, you can build a child’s confidence and help him excel academically. You can also mentor children through Big Brothers Big Sisters, an organization we’ve supported for years via donations, and by volunteering at events, and even by having Littles of our own. Helping out doesn’t have to take much time, but it will definitely reap big rewards for both you and the child you mentor. Learn about BBBS below or watch the inspiring stories of this years Big Brother and Big Sister of the year. These days when it appears that the world is coming apart at the seams, it may sound naïve or misguided to say that we live with hope. Yet we believe that conditions will improve, that one day we will awaken and realize that the crises now enveloping our world will be a thing of the past. But until that time, each of us has to step up and pursue change, working ordinary miracles every day. As we do, perhaps we’ll make an indelible mark in someone else’s life, so one day they too will know that no matter where they are or what they’re going through, we’ll live within their hearts, always inspiring them to live their best lives and discover their possibilities.